Don't you just love the Target Dollar Spot, Michael's dollar area and stores like Five Below? I do. The thing is that I keep picking up the $3 goodies instead of the $1...hhahahaha. I have so many lovely things that I've accumulated that are really nice and I'd love to share them with my swap-bot friends. Thing is that all the Christmas swaps I've seen on here are for $1 item or small items that will fit in your stocking. Well I have things that won't fit in a stocking and save room for other swap months. HA! This is why I want to hold this swap. I am going to try and make it a reoccurring monthly swap from now until December if it seems to be a popular swap. 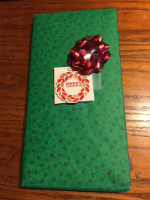 Gift must be $2 - $5 BEFORE shipping costs. Gift needs to be wrapped. Only new or unused items. Please don't de-stash your craft room for this swap. HA! Tag with your Swap name and name of swap.